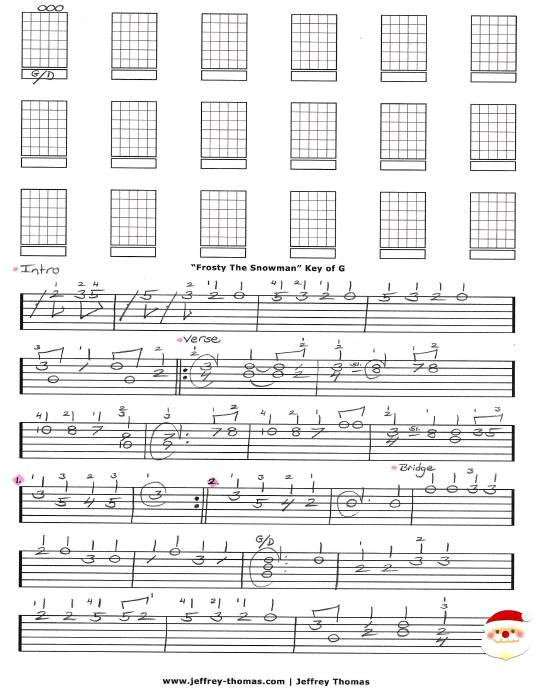 Frosty The Snowman Free Guitar Tab by Jeffrey Thomas. Here is another highly request Christmas classic! I have my arrangement in the key of G including the intro, main melody and ending. This version will work great as a solo or for vocal accompaniment. Want the full guitar tab for free? Just send in your email address using the form provided. Looking for online guitar lessons? Fill out the Schedule A Free Lesson form to set up you free Skype guitar lesson today. “Frosty The Snowman” was written by Walter “Jack” Rollins and Steve Nelson. Gene Autry and Cass County Boys were the first to record it in 1950. Find more great online guitar tabs on my blog, video and tab pages.